Anybody who grew up in the early 90s has probably heard of AOL – one of the biggest internet giants of the dot-com bubble and one of the most humbled stragglers when it burst. AOL, previously known as America Online began its rise to prominence as one of the big three internet service providers in the United States. At the turn of the millennium AOL and TimeWarner orchestrated the largest merger in corporate history – AOL buying the traditional media conglomerate for $165 billion. Cultures clashed, hubris prevailed and the synergy of new media and old media never eventuated. 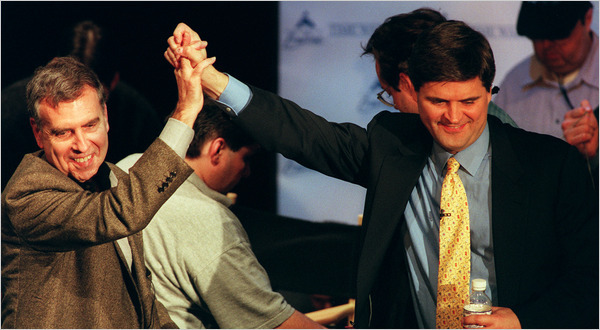 Former Time Warner chief Gerald Levin and former AOL chief Steve Case celebrate their merger in 2000. In 2009 Time Warner announced that it would be spinning off AOL – marking the end of what is generally regarded as the most failed marriage in corporate history. AOL hasn’t since reached the peak of its glory days in the late 90s and early 2000s, and probably never will. Enter Tim Armstrong. Following the capitulation of the AOL and TimeWarner mega-merger, in 2009 Tim Armstrong was called in to steady the ship. Armstrong was a former advertising executive at Google, which was perhaps the greatest indication of AOL’s purported direction. AOL needed to transform itself into a media and advertising conglomerate – part BuzzFeed, part Google – and away from its image as a legacy internet service provider. On paper, Armstrong was perfect for the job. One of his first executive roles was as the president of Internet ventures at Disney’s ABC/ESPN, where he was tapped in to help an ageing television business make inroads in the internet age. If there was anybody who had any idea about transforming old business into new business, it was Tim Armstrong. Despite this, his tenure at AOL has resulted with varying levels of success. Some hate him, some think he’s done an admirable job. But you’d be hard pressed to say that people love Armstrong. After all, he’s a bit of a renowned prick. He’s made the press numerous times for all the wrong reasons – in 2013 he publicly shamed and fired an employee for taking a photo during a conference call, you can hear it below (firing occurs 2 minutes in). He later apologised but never re-hired the guy. Not long after that colossal brain-fade, he proceeded to take a massive dump on two female employees who got pregnant with ‘distressed babies’, racking up healthcare costs in employee benefits. He doesn’t seem like an awfully empathetic person, a trait that is often seen as the mark of good leadership. But then again, as much as good leadership is symbolised by good people management, the end game is still undeniably the financial bottom line, and the ability to deliver value to customers. In his efforts to transform AOL from a lumbering internet dinosaur into a contemporary online media conglomerate, Armstrong has orchestrated enormous acquisitions, obtaining top-shelf internet properties such as The Huffington Post, TechCrunch and Engadget. Armstrong seems to know what he’s doing. Taking the stage at the Tribeca Film Festival, Armstrong declared “We’ve entered the machine age of media”, alluding to AOL’s vision to develop a media company that is deeply receptive to users and the way they access content. The internet allows media companies to be adaptable and dynamic, whereas dated mediums such as newspapers remain static regardless of context. Armstrong’s obvious desire to position AOL for the future has investors optimistic: since 2009, AOL’s stock price has nearly doubled. Unfortunately, every time Armstrong proves his worth with statements like the one above, he shoots himself in the foot by virtually destroying the very items that he acquires. Armstrong’s much criticised master plan for improving the output and traffic of online journalism – dubbed “The AOL Way” – instigated, amongst others, the exodus of editors and writers on tech blog Engadget, who then went on to create ‘The Verge’, a competitor site that is arguably a lot better. Tim Armstrong viewed journalism as a vehicle to sell ads, a position that departed Engadget editor Paul Miller described as one that “makes good business sense, but doesn’t promote good journalism or even good entertainment”. A lot of people that are universally considered great leaders are known as assholes: think Steve Jobs (Apple), Mark Zuckerberg (Facebook) and Travis Kalanick (Uber). Having said that, one of the requirements that often excuses leaders being assholes is that they lead remarkable corporations. Armstrong has done a respectable job in pivoting the slow giant that is AOL. Enormous business transformations are phenomenally difficult, and what AOL is doing is not just a huge corporate re-structuring but an entire re-focussing of its vision. Armstrong’s ability to mobilise this effort without the entire corporation buckling at its knees deserves credit. But above the insufferably rash treatment of employees and divisive corporate manoeuvres, perhaps the most concerning element of Armstrong’s tenure at AOL has been his inability to truly validate the company’s reason to exist. AOL still makes the majority of its revenue from internet subscribers too lazy to find something better, and its media acquisitions would have been just fine, if not better, on their own. Until Armstrong can give the company some meaning, the road back to relevance is going to be a tough slog.